I want to begin this beautiful Advent season with a benediction, or a blessing. Flipping the calendar to December brought a smile to my face. Anticipating the Christmas countdown I've created with my family, experiencing the beauty of snow, reading by the fire...these are all things I look forward to during this lovely time of the year. But, as we always must do, we must remember to fix our eyes on the One this holiday is celebrating. 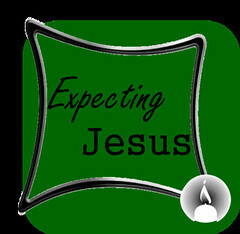 For it is time to expect Jesus! As a Believer in Christ Jesus, it would be a sorry thing for me to go through this Christmas season with my focus on finding the perfect gift, hosting an amazing party, or making the most delectable cookies. Those are all things I enjoy about this season, but they, of course, are not the center of it all. Beyond these wonderful aspects is the true purpose. My heart must expect Jesus. In thirty-one days from now, we'll turn our calendars again. We'll likely hunker down through some snow storms. We may grow quite weary from the dreary weather and barren landscape. Those marital troubles might loom large and that rebellious child may push us to our limits. An illness, a troubled friendship, resentment or jealousy may rear their ugly heads again and our focus may turn from the One in whom we have eternal hope. In the barren seasons, may we expect Jesus. Who is able to do immeasurably more than all we ask or imagine, according to His power that is at work within us, to Him be glory in the church and in Christ Jesus throughout all generations, for ever and ever! Amen. As we expect Jesus to be present in all things now in this holiday season and always, may we also expect Him to do quite the unexpected--both for our good and for His great glory.